At twenty-four, Josh Axelrad held down a respectable and ominously dull job on Wall Street. Adventure was a tuna fish sandwich instead of the usual turkey for lunch. Then one night, a stranger at a cocktail party persuaded him to leave the nine-to-five behind and pursue an unlikely dream: the jackpot. The stranger was a blackjack card counter, and he sold Axelrad on the vision of Vegas with all its intrigue, adventure-and cash. Repeat Until Rich is Axelrad's taut, atmospheric, and darkly hilarious account of ditching the mundane and entering the alternative universe of professional blackjack. Axelrad has one thing in common with his team: Jon Roth, the leader and a former options trader; Neal Matcha, a recovering lawyer; and Aldous Kaufman, a retired math PhD candidate. They all thrived in the straight world, found success boring, and vowed to make life more exotic. 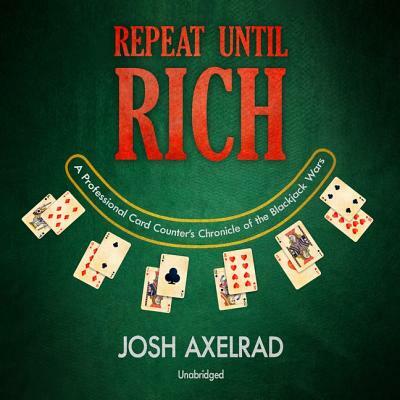 Axelrad adopts Roth's philosophy-repeat until rich-and from his strategy and skill spring hasty retreats across casino floors, high-speed car chases, arrests on dubious grounds, and the massive cash paydays that make it all worthwhile. Along the way, he unveils the tactics and debunks the myths of professional card counters. In team play, he's either the big player, who bets the big money, or the controller, who subtly coordinates the team's betting while wagering only the minimum himself. Counting is not illegal, and it's less intellectually daunting than its MIT-level mystique suggests. With clarity and wit, Repeat Until Rich proves the old gambler's maxim that if you can tip a waiter, you can count cards. But it also proves how zealous, even forceful, casino bosses can be in backing off counters-seeing past their undercover methods and banning them from the tables. Josh soon grows to love all this trouble, and he discovers, more than the money, what he needs most of all is the rush. Filled with actual bad guys, chase scenes, and high stakes, Repeat Until Rich offers an intoxicating, unprecedented view of the dangerous allure of living off the cards and one's wits.